king pins and some other parts are no longer available from AGCO. Is there another parts source besides AGCO? also,,king pin sockets are not shown....were they even available separately from the front assembly....I am guessing the sockets were similar to big u-joint caps with pin rollers. 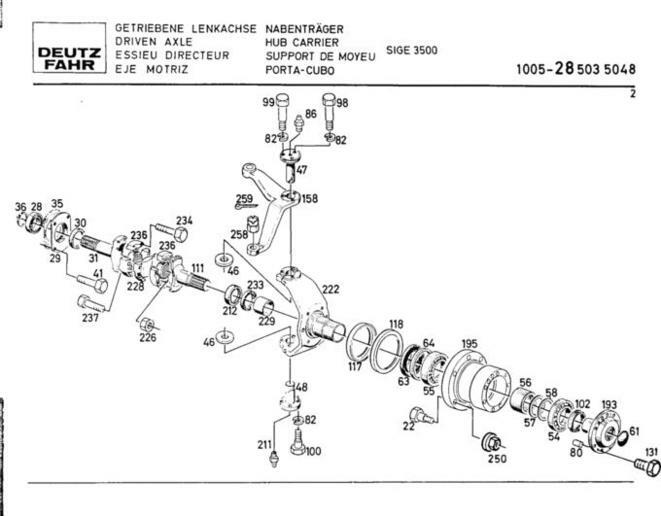 I think Deutz used ZF front axles. There should be an ID tag on the back side of the main axle housing. Try searching European tractor parts sites. I needed some cam bearings for a Standard Motors diesel in an TO 35. I was working for an engine parts supplier at the time, and there were none in North America. Found them in England. Ordered from them and they did all the paperwork, and we got them in 5 days. I've had stuff take longer from Chicago. this past summer a customer of mine needed parts for a 130-06 and I located a dealer/salvage on a referral and then located them on the internet. he traveled from michigan to there for the parts both new and used, I think this was the dealer. I would have to ask him to be certain though. there is ward bros in NC they are only salvage. Dale has quite the yard there. Grew up down the road from there.